This thermostat kit fits small and big block Chevy. Many marine engines run far too cold to obtain proper combustion temperature, resulting in lower power output, economy and engine life. Most engines are designed to run at a minimum water temperature of 160 degrees to achieve peak performance. This thermostat system is designed for use on cold water source cooling systems. It will keep the engine temperature between 140 and 160 degrees. The temperature will cycle up to 30 degrees within this range, due to cold water entering the system when the thermostat opens. We do not recommend this system be used on supercharged or turbocharged engines which run for long periods of time at maximum or near maximum power output. We do not recommend this system be used in extremely sandy areas - sand build up can interfere with proper operation of the thermostat. 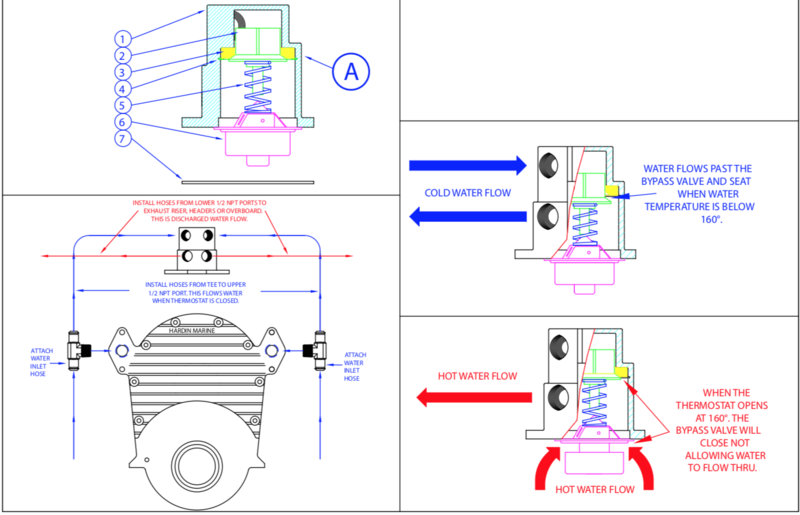 Step 2 Install 540-160104 seat into the thermostat housing, as shown in Figure A in the attached drawing. Use 540-160105 locking ring to hold in place. Step 3 Install 540-160101 thermostat into the intake manifold. Apply high tack gakset sealant to 620-04112 gasket and install on intake manifold. Step 7 Install thermostat housing using the supplied 3/8-16 bolts and washers. Torque t0 25 inch pounds. Step 8 Install (2) tees in the front water inlet locations as shown, (2) 1⁄2” NPT to hose brass tees are supplied in the kit. Run a bypass hose from one end of each tee to one of the TOP ports of the thermostat housing as shown. These bypass hoses flow water to the exhaust when the thermostat is closed. Step 10 The engine water outlet ports are the BOTTOM (2) ports on the thermostat housing. Plumb these lines to the exhaust or overboard discharge, (the same way they were before you installed the thermostat unit). That’s all there is to it. Your engine will now operate in the proper temperature range resulting in better idle, better fuel economy, more power, and longer engine component life. Coupling Suits Super Chev 1"